EMC Testing (or Electro-Magnetic Compatibility testing) is testing the ability of an electronic device to operate in its intended environment without interference (immunity testing) and without causing interference to (emission testing) other devices in the same environment. EMC Testing for Australian C-Tick / RCM compliance requirements to ACMA mandated EMC standards (AS/NZS CISPR 22, AS/NZS CISPR 14.1, AS/NZS CISPR 15, AS/NZS CISPR 11 etc). >EMC testing (emissions and immunity) for European Union CE compliance requirements for EU export (EN 55011, EN 55022, EN 55014 EN 61000-6-1, EN 61000-4-3 etc). 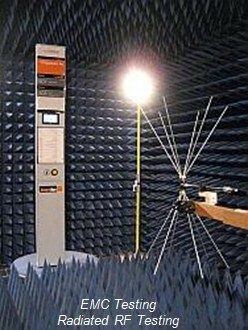 Low power radio transmitter EMC testing to Australian (AS/NZS 4268) and European Union (EN 301 489, EN 300 328 etc) radio compliance standards. Automotive or vehicle component EMC testing to diverse range of OEM manufacturer standards (ISO 11452, JASO, ISO 7637, Mazda, Toyota, GMW, BMW etc). Compliance Engineering have been accredited by A2LA (NATA accepted equivalent) to perform testing to many EMC test requirements detailed above. Our EMC testing facilities can also be hired out on a time basis, for preliminary EMC testing, prior to formal compliance testing to investigate and modify products that do not comply with relevant EMC standards. If you can obtain a CE EMC testing report from your overseas supplier, you may not need to repeat EMC testing for compliance with Australian C-Tick / RCM requirements. Compliance Engineering can assess EMC testing reports for suitability against Australian EMC Testing requirements for C-Tick / RCM. The outcome of an EMC testing report assessment is a detailed written assessment identifying suitability along with any shortcomings that should be addressed.